Best Multi-Format Campaign: A colorful, fun fact packed campaign promoting the Adler Planetarium (Chicago, IL). Best Furniture/Transit/Alternative Campaign: Bus shelters featuring Denver Water’s incredible handmade, 3-D “You Can’t Make This Stuff” ads. See the rest of the winners and read the article. Call Arizona Billboard Company to create your own inspired ad campaign. Businesses are always seeking new ways to advertise and promote their services or products to the most effective audience and there are so many methods of advertising it is often handed over to marketing firms or specialists. Arizona Billboard Company is one of the specialists. We know how to take advantage of different businesses and industries, understanding there’s not just one right way. We know billboards are effective so lets quickly go over the advantages. Since billboards are seen along highways and busy streets, you are guaranteed visibility. Also, unlike commercials or magazine ads, you cannot flip the channel or turn the page. 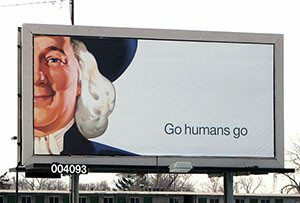 It is proven that people will notice the billboard whether they like it or not. The same is true for vehicle wraps and graphics. The difference is that many people travel the same route every day, such as a commute to work or to the store or to Grandma’s house. That equates to branding. Your customers will see your billboard regularly, which makes it more likely to stick in their minds and eventually make that purchase or appointment. You know your business and where your market lives. That means you can place your billboard advertisement wherever you feel it will be the most effective. This is a huge advantage when you have a business service area or are targeting an income level or regional mindset. You can also use billboards in areas where reaching people is difficult like a rural farming community or secluded truck stop. We’ll help you figure out how to use this with the best results possible. Now we must discuss a few rules that lead to successful use of the above advantages. On average, a person will see your billboard for three to four seconds. This means you have to keep your message short and poignant. 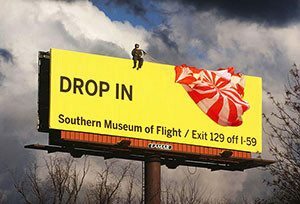 Successful billboards focus on images and very short blurbs or memorable logos. 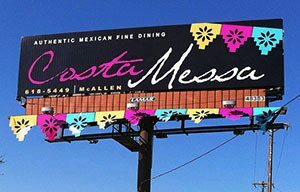 Billboards are often seen by drivers who don’t have time to read or write something down so any text on the billboard must be large, read easily and memorable. Billboards are often rented for long-term commitments. This is because it takes a time, energy and money to change billboard ads, but also because the longer the customer sees your message, the more likely they will remember and make a purchase. Branding is the act of creating a nice little spot in someone’s head so that when they need your product or service, they know where to go. We recommend a contract of at least three months. Digital Billboards don’t have the associated cost of vinyl removal and installation but the same rule applies. To stand out of the crowd, you have to make the most noise. Call Arizona Billboard Today and find our how we can help you succeed in your billboard campaign. Focus on a single idea. Viewers have 4 to 5 seconds to see and understand your billboard. Out Of Home advertisements need to be straightforward and to the point. Here at Arizona Billboard Company we know this is the single most important factor of a successful billboard campaign. We tell the truth, and we don’t fluff message. We help you to resist packing lots of information onto a billboard because your customer just wont read it. When designing Out-of-Home we select readable fonts. There are standard fonts that work well but we’ll also want to use a font that you are already using in your media or website. Fonts used for OOH designs must be easy to read from variable distances so we’ll use large, legible typefaces. If your font has thin strokes or ornate script designs we will recommend a different font. Adequate spacing between letters, words and lines will enhance visibility. Last but not least is the use of Color. Is your billboard among green trees? If so, we won’t use a green background. If your billboard is high in the sky, we won’t use blue. Billboard placement and the colors used on the board is a skill we possess and a tactic we use when considering artwork. Research by OOH proves that high color contrast can improve out-of-home advertising recall by 38%. We will choose colors with high contrast in both hue and value as well as contrasting colors that are easy to see from great distances. If you’ve stumbled upon our services, you’ve found the right billboard company. Call us Today! 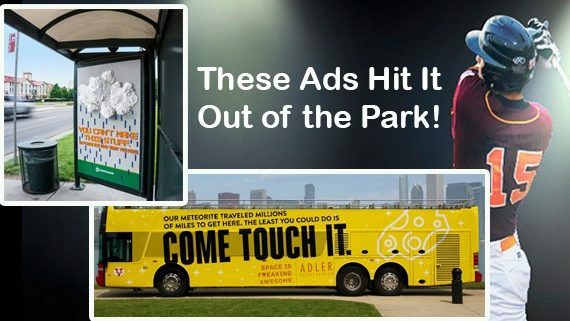 One of the best ways to get the most out of your advertising dollar is to create a memorable, clever campaign that will leave a lasting impression with everyone who sees your ads. Here are three tips on getting creative – with creative! Take the basic idea you want to communicate – your concept – then exaggerate it. Push it beyond reason and reality using copy, visuals or both. An interesting approach is to exaggerate the visual and understate the text, or vice-versa. Simplify your message, the main point you want to get across, into one sentence or visual, and push it…all the way to outrageous! Your character could be an actor playing a role, or even an illustrated or animated creation. You have total freedom to create and brand yourself – remember that while a “brand character” should represent your brand, in invented character does not…try taking a risk with characters that are outside your brand. Engaging, out of the ordinary characters stand out because they’re quirky, memorable and break through the ho-hum advertising clutter. Most everyone has a problem or two – and it could be your product that provides a solution! If your product or service is a problem-solver, start off with what might be the issue at hand. Later in the ad, address how your product/service takes care of the issue – this works particularly well if your business takes care of a big consumer issue/concern. The bigger the problem, the mightier the impact your one-line solution/image will leave. Billboards are everywhere and we, most likely, see hundreds of billboard ads during a typical week, but retain just a few. Who can remember all those ads anyway? We remember relevant ads to us and ads that stand out and communicate well. Outdoor ads and marketers are becoming more competitive and it’s important to know a few rules to make your advertising as effective as you can. We’ve compiled six strategies to ensure your billboard has the highest chance of being noticed, and more importantly, remembered. Most people are on the move when reading billboards and don’t have a ton of time to absorb the message. That gives us around six seconds to read a billboard. Conclusion: six words is all you should use to get your message across. It is possible to increase this a few words depending on location of the board, but as a rule, less is more effective here. Keeping a message this simple is tough, but small paragraphs will not be read so why spend money on crafting a paragraph. That means, if you have a complex brand, product or service, stay away from billboards or have our marketing team craft a pithy solution for your message. We have experience in creating INTERESTING ads that drive traffic to websites for more information. 2: Make a Positive Impact, Not a Huge Distraction. Billboards are aimed at drivers, bikers, cyclists or pedestrians. This creates a dilemma for the advertiser; get noticed, but be responsible. You don’t want to cause any major, or even minor, accidents. The billboard “Hello Boys” Wonderbra ads caused havoc. Drivers were so attracted by Eva Herzigova’s cleavage that they crashed into poles, medians and even other. So, while distraction is paramount in many ads, there is a fine balance with billboards. 3: Billboards are Not the Best Time for Direct Response. Billboards covered in phone numbers and website addresses may miss the mark. A hard number to remember or a long website address will not be remembered by 99.9% of the people who actually read the billboard. A billboard is a secondary advertising medium. It’s best as a brand-building and support campaign, but it cannot do all the heavy lifting. We have 800 numbers that will be remembered and we can suggest a web address that will link to your site. 4: More Billboards, More Better. One billboard is not cheap. But it’s also not the most effective either. Billboards are a mass market medium, and they need support. We’ve found that you want more than one to get as many eyes on them as possible. Every billboard is rated, called Gross Ratings Points (GRP) . It’s based on traffic, visibility, location and size. This rating gives you a score between 1 and 100. 50 means that at least 50% of the population would see one of your boards at least once a day. If you have only one board, your impact chances are less than if you have three or four. You really want a 100 score, but those boards are not cheap. 6: Show it, Don’t Say It. Be creative with your billboard layout. 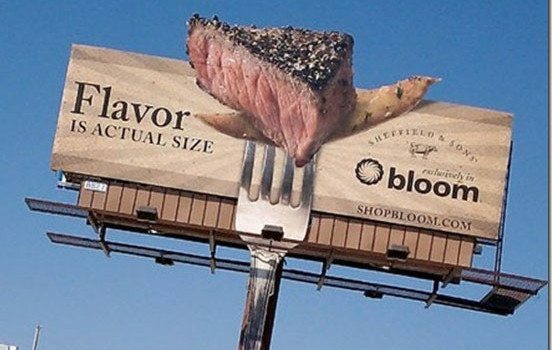 A flat billboard is the standard, but it doesn’t have to be flat. You can go 3D, have moving parts and even have your billboard animate. There is no reason that it just has to be a large, simple print ad. You have an opportunity to do something eye-catching and memorable, so do it. If done right, you’ll create additional press, for free. A recent example of that is this simulated crash billboard that got major coverage from multiple news stations. The price of the 3D board was more than the cost of regular artwork, but it paid for itself many times over with PR impressions. We’ve seen this personally in our business and are excited about the trends. 1. Street- Level Interactivity Many out-of-home providers have success stories involving an interactive component to their digital signage. In 2013 there was an influx of more interactive screen and kiosks as well. Simple interactive interfaces, messages or QR code elements move beyond impressions and generate consumer engagement. These include touch screens, senses (sight, touch and sound) elements and more! 2. Interaction with Mobile phones and Facebook (or other social media outlets) This is easy to incorporate into your ad. Bring potential customers to your site through QR codes or facebook address with coupons, special messages or extended content. This can increase a website search engine ratings with will allow more and more people to find you via Google, Yahoo and Bing. 3. Advanced Audience Metrics These involve data-centric technology such as facial recognition. Your ad can literally count how many people stop and read the ad. Some advanced ads can also perform and detect gender ratios, age and other demographics. Predictive analytics will help marketers direct ads toward a specific audience. **Not all of these technologies are available to us in Tucson and some are available in Phoenix. But we are keeping up with trends and will let our customers know if new opportunities come to light. Call Arizona Billboard Company today and find out how to start your marketing campaign. We have tools at our disposal which will help you target the audience you need, designers to help simplify and clarify your message and QR codes that bring your audience to your website or facebook. We can help! Failure to adhere to these rules may result in campaign failure. Period. We know that sounds harsh, but it is true and the truth is what business needs from advertisers. We want our customers to succeed and come back for more billboards and that is why we are adamant. The rules are tried and tested as well. Universities and governments study the propagation and effectiveness of billboards and we really believe in passing that information on to our customers. Keep Headlines Short and Sweet. Headlines grab peoples attention and should communicate your boards intention with six words or less. That makes sense. Your trying to communicate to people driving 40 MPH in town or 70- 80 MPH on freeways. Your competing with backseat drivers, noisy children demanding to repeat that Frozen song and a cell phone begging to be answered. Show rather than tell Telling in a billboard can lead to too many words. Sometimes you need a great picture that speaks loudly for your brand or service. Maybe get a 3D element in there. The possibilities are endless here. We know creating memorable headlines and images can be difficult. But we’re here to help. We’ve got lots of experience in creating something memorable without being too complex or confusing. A Call to Action isn’t always Necessary Your entire billboard is a call to action to buy something, turn left at an exit or go to a website. So there’s no real reason to add type or verbiage that tells people to take action. Just give them the information, make it appealing and like hungry fish, they’ll bite. 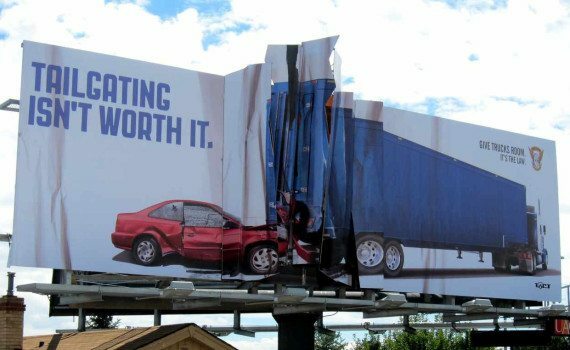 We’re always looking for ways to show our customers what working with a bad billboard company could get you: You could waste your hard earned dollars on ineffectual advertisements that at best fail to bring in a single customer and at worst, send your customers to your competition! The first board is an example of an effective board. I like to show this first because you can immediately see the difference in the following bad boards. This one has an emotionally charged image with clear and precise directional. This board will get you clients. There is no doubt. These are the kind of boards we design at Arizona Billboard Company. The next board is an example of content that would do better on a website or brochure. You can’t read the explosion of text or even pick something to read very quickly. And at 85 miles per hour, you’ll just miss it all. This third image is laughable. You’d think this was a joke, but it is not. There are so many boards out there that are blocked by trees, buildings or other obstructions. We know how to pick boards so you don’t pay for mistakes like these. Finally here’s a board that seems to follow all the rules but doesn’t. You’ve got the huge logo there. So you’ll get some success with that. But what about the other type down there? Is it important? It sure is otherwise you’d never put it on the board to begin with. 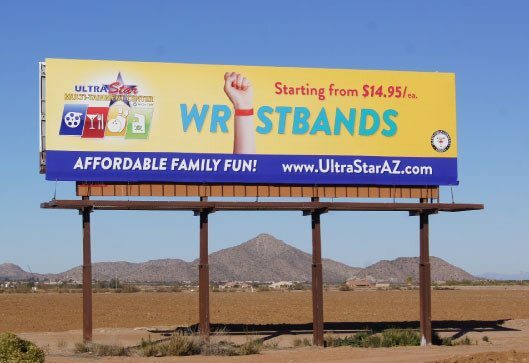 Contact Arizona Billboard Today and see what we can do for you! We get the design right so your ad campaign is as effective as it can be. What are all those square pixilated stamps we’re seeing on ads? They look like screen images of old video games like Asteroids or Space Invaders. Are they bar codes of some kind? What they are are QR codes. They’re like bar codes but better. They’re not for the retailers but for the customers. You scan them. They are coupons, VIP webpages, video links and tons of other things. How do you read them? Let’s look at what they are first. A QR code is a two-dimensional bar code. QR stands for ‘quick response’ and while it might look like Space Invaders video game from the 1980s, the codes hold data that can transmit information to you or your customers. Smartphone or tablets, consumers can download a free app that enables them to photo the bar code, which directs the phone or tablet to a Web site of the business’ choosing: a coupon, facebook page, restaurant menu, business profile, YouTube video – virtually anything with a dotcom address can be imbedded into a QR code. Rather than over complicating your ad or billboard too much info, a QR serves as a quick link to viewers/customers interested in learning more about a product or service. QR codes are incredibly popular in Japan, South Korea and other parts of Asia and they’re are starting to gain momentum in the U.S. In fact, they are popping up on everything from e-mail signatures and business cards to “Late Night With Jimmy Fallon” and even gravestones. We’ve even seen QR code’s in storefront windows. So when shoppers scan the code they instantly get specific info about sales, learn more about the designers featured in the window display or available merchandise. In this sense, QR codes help bring offline customers online. Consumers love them, and as awareness grows, use them more and more frequently. Arizona Billboard Company can add a QR code to your billboard or bus bench ad- or any ad you get from us. For small business owners to large corporations, there are a host of reasons to use the QR codes.